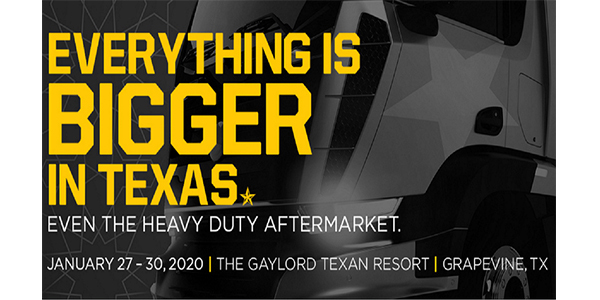 Heavy Duty Aftermarket Week (HDAW), the largest North American gathering of the independent heavy-duty aftermarket industry, has announced that the 15th annual conference, traditionally held in Las Vegas, will move in 2020 to the Gaylord Texan Resort & Convention Center in Grapevine, Texas. The move will accommodate the increased need and industry demand for more exhibit space, expanding the Product Expo by 80 percent, from 100,000 to 180,000 square feet, and adding more than 250,000 square feet of meeting and event space, allowing HDAW to expand opportunities for industry meetings, events and distributor education offerings. HDAW 2020 will be held Jan. 27-30, 2020. This business-to-business event welcomes more than 2,500 executives and managers from the U.S., Canada and six other countries – including distributors, suppliers, service providers, educators and industry media. Event organizers say this move guarantees the supplier community larger exhibit space options and an accessible hotel venue making the event convenient and affordable. HDAW 2020 will offer the independent aftermarket four days of targeted distributor education workshops and product training, including “SOLD!” (Service Opportunities & Learning Day), offering a two-day program designed for distributors with service and repair technicians. In addition, the event will feature a product expo with the latest in heavy-duty parts and services on display. Product experts will be available to assist attendees with gathering the information they need to make buying decisions. Attendees also will benefit from the multiple peer networking opportunities, social and spouse activities, as well as the popular supplier and distributor one-on-one meetings, giving the heavy-duty aftermarket community opportunities to share ideas, collaborate, make business connections and have some fun. For more information, visit hdaw.org.